While investigating around the crash of an Allied night intruder aircraft, lost close to Brescia, central Po Valley, during the late Summer of 1944, old people have conducted Luca Merli and Diego Vezzoli in a field where, as they remembered and reported, “an airplane did crash towards the end of the war”. After long and difficult research, the two aviation enthusiasts have been able to locate exactly the crash point of the plane, and some small debris has been brought to light. It turns out that the remains belonged to a Douglas-Aviation-built aircraft, and thanks to exhaustive investigations in local archives, they have discovered it was a 47th BG (Light) A-20 Havoc. 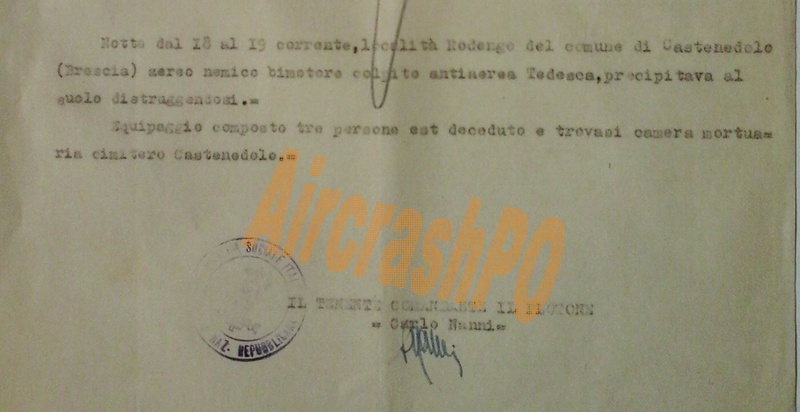 A document retrieved in the local archive at Castenedolo, a small town close to Brescia, states that on the night bewteen March 18/19, 1945, an allied plane was hit and shot down in flames by a/a fire of Ghedi A/D. Three airmen lost their lives in the crash. By checking the AFHRA reel A-6310 (“Targets attacked by the Twelfth Air Force”) and A-6116 ( M.A.S.A.F. Intopsum), evidence was found that on that night an A-20 Havoc was lost during a night-intruder mission over the central Po Valley. Thanks to Mrs. Patricia Johnson from Prescott Arizona, the researchers have managed to get some information and data about the three airmen, who are now buried at Florence ABMC. Mrs. Johnson's data is the the table below. I could not find any Newspaper Articles; or Military Photos; or family connections of any of these men. Note: Entered the service from California. Note: Entered the service from Connecticut. 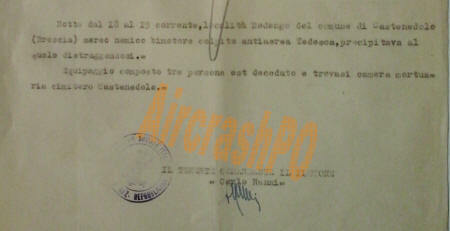 Document from the local authority that documented the crash. Next month, a more accurate investigation will take place, with the aim to find out more remains of the plane.